Recent press reports on the impending North Korean nuclear test have been ambiguous. Some have quoted reliable sources that a test is imminent. Others have stated that there are no obvious signs that a test will happen soon. 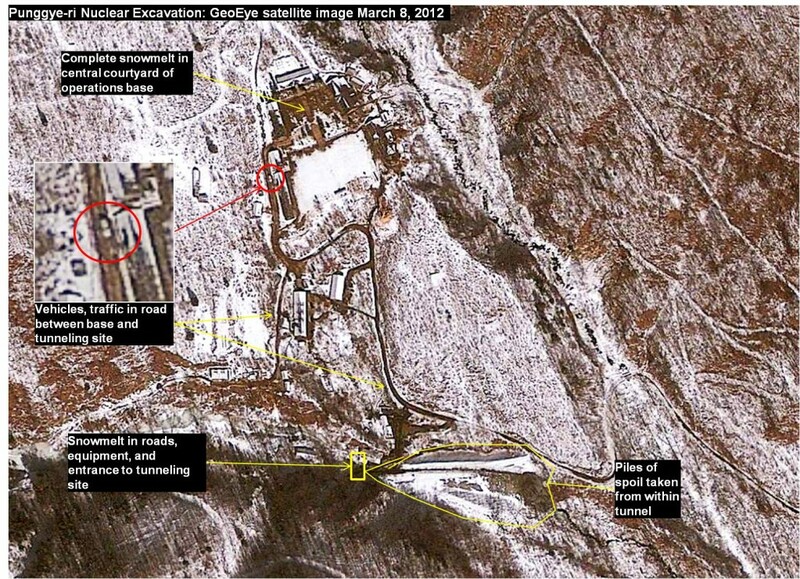 The most recent commercial satellite imagery available of the Punggye-ri Nuclear Test facility supports the contention that preparations are continuing and that the North Koreans are preceding as if the test go-ahead decision has already been made. The imagery does not, however, give any indication of when that detonation may take place. Satellite pictures from April 18, 2012 are the latest in a series of photos that document continuing preparations for an upcoming nuclear test. 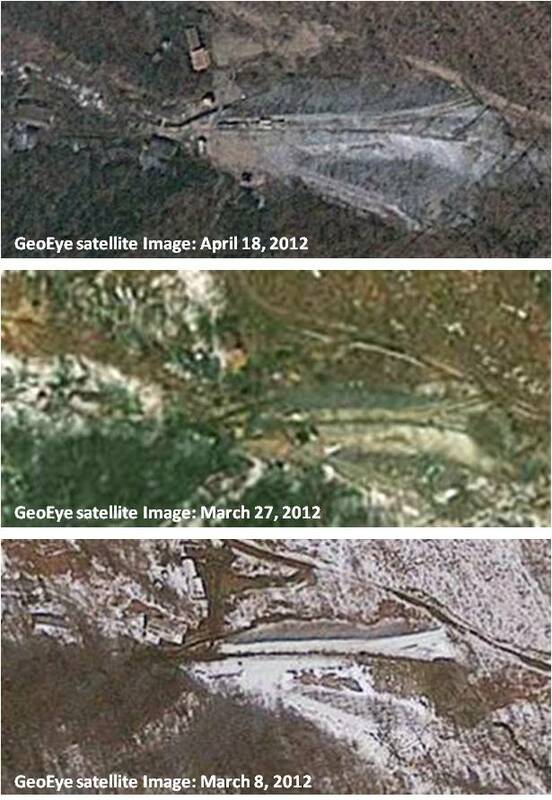 A March 8, 2012 image shows that North Korea dumped spoil material—excavated from the test tunnel—and created two adjacent teardrop shaped mounds, together covering an area that is 300 square meters greater than observed in 2011 (indicating that the tunnel has been expanded since then) (see figure 1). Overall, some 8,000 cubic meters of rubble have been excavated at the site covering 4,000 square meters. The photo also reveals a dark-toned material situated adjacent to the tunnel entrance which may be stemming material intended to eventually seal the tunnel, but is more likely mud impeding work at the site. The imagery, taken after a recent snowfall, shows significant activity: the road system around this remote base is entirely snow-free, indicating extensive vehicle traffic. The central courtyard of the operations base is also clear of snow and there are several signatures of generator activity. A rail line for mining carts (also visible in subsequent pictures) that has been used to bring out and dump excavation material, also known as “spoil,” is visible. Vehicles, structures and unidentified objects are on top of and around the spoil pile, perhaps to prepare the test device and diagnostic equipment in the test chamber. Once that is done, the mining carts can be used to deliver stemming material and spoil to seal the shaft during the final test preparation stage. 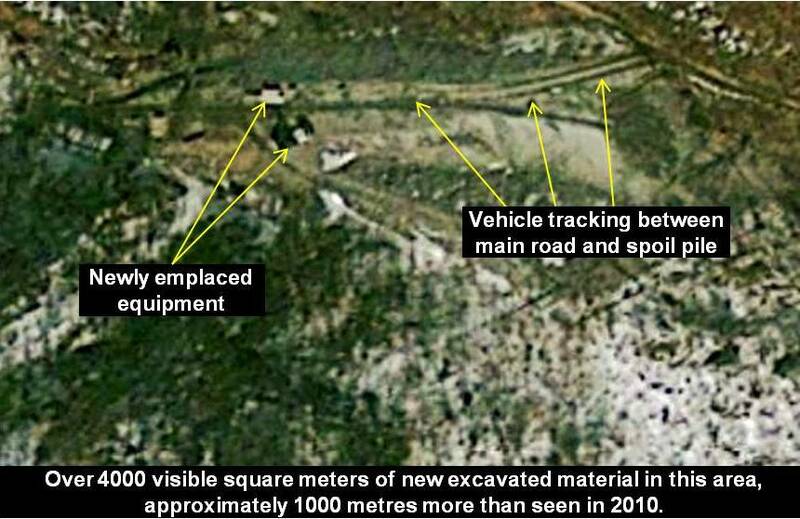 A satellite photo from March 27, 2012 shows that there is new vehicle tracking on the spoil pile from the road to the tunnel portal and small pieces of unidentified equipment were also newly placed on top of that pile (see figure 2). It is unclear at this time what this new activity specifically represents with respect to nuclear test preparations. 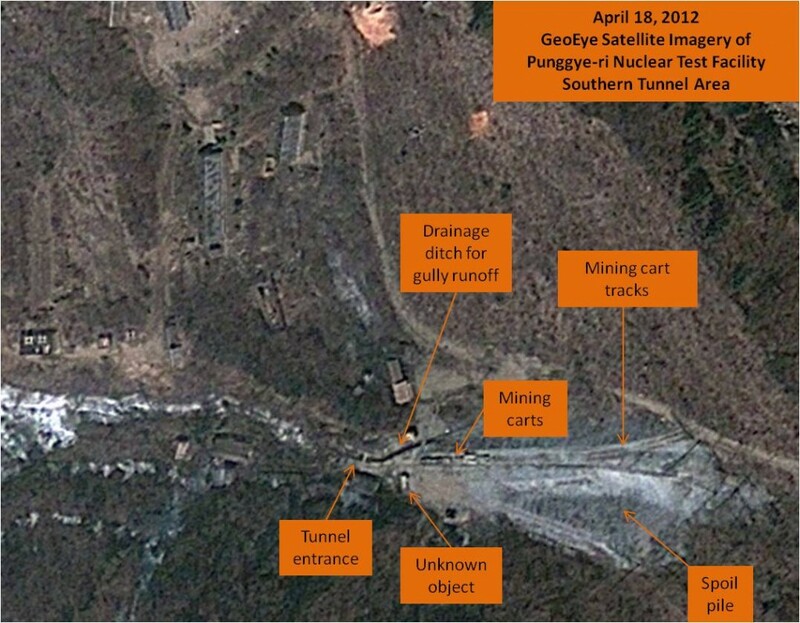 The latest imagery, taken April 18, 2012, documents continuing preparations for an upcoming nuclear test and shows a train of mining carts on top of the spoil pile and random unidentified structures or objects on or near the piles (see figure 3). 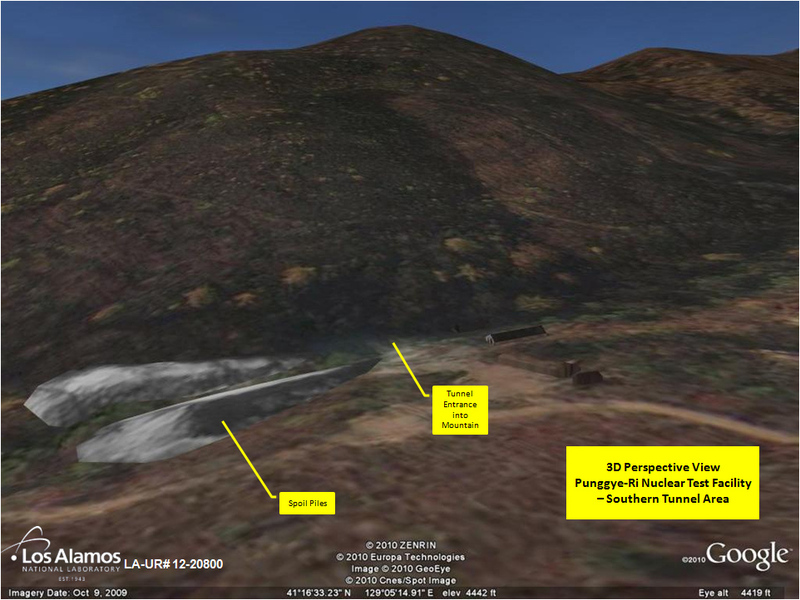 Based on an examination of previous satellite photos, their position and number appear to vary on a day-to-day basis, indicating the continued movement of vehicles, structures and other objects on or near the spoil piles at the mouth of the test tunnel. According to one press report on April 21, the North had completed the removal of the large spoil pile near the test site, probably to seal the tunnel for the explosion. However, this imagery shows the size of the pile largely unchanged. Whether the test device has been emplaced in the chamber and stemming with other material has been completed, remains unclear. The April 18 photo illustrates a drainage ditch that passes water flow from a gully around the spoil pile that blocked the original path. Without such a ditch, the entrance would be muddy, making it more difficult to work in the area. The following 3D ground level rendering of the site highlights the steepness of the terrain and the need for such a ditch. Figure 5: Successive March – April 2012 imagery shows increasing activity around spoil pile. This article is a “38 North” exclusive with contributions by Jack Liu and Allison Puccioni.